After simultaneous debate in both chambers of the Mississippi Legislature Tuesday, state lawmakers approved a religious freedom bill that some have argued could lead to discrimination against LGBT people and others. First in the House, the bill passed 79-43, and later, Senate lawmakers approved the bill with a wide majority. Gov. Phil Bryant is expected to sign the bill into law. 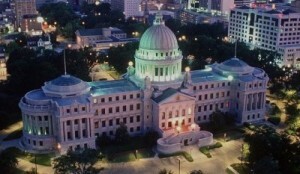 As it is written, Senate Bill 2681 — or the Mississippi Religious Freedom Restoration Act — largely mirrors the 1993 federal Religious Freedom Restoration Act and other bills passed in 18 states that mirror the federal law, except for language that prevents employees of private businesses from raising legal claims against those employees under the bill. Proponent lawmakers say the bill will protect state citizens’ free exercise of religion from government intrusion, while some lawmakers in both chambers questioned whether it would have unintended consequences — including permitting discrimination. Several lawmakers questioned the bill’s sponsoring lawmakers in both chambers. It’s important to note that there are still many politicians and pundits working out of Atwater’s playbook on the race issue today. And now they’ve augmented that with anti-gay dogwhistles. You can’t say “God hates fags,” because being anti-gay is no longer socially acceptable, but you sure as hell can say “religious freedom” over and over again, because the intended audience knows exactly what you’re talking about.